However, there has been much debate and attention focused on Adam on forums like eRoperParker and Decanter in recent years, centered on a Los Angeles Times article entitled, “Are California Wines Over the Top?” The article included a quite fantastic quote that set the internet wine pundits a-buzz. “I’d stopped drinking my own wines,” it quoted Adam as saying. It prompted headlines on various blogs such as, “Adam Tolmach of Ojai Vineyards is in the LA Times today. 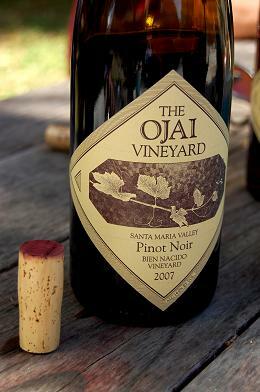 It looks like Adam has gotten tired of serving the dark Sith lord Darth Parker…” The article, focused on Ojai Vineyard’s recent efforts to tame the alcohol content of some of their wines, wines that previously received very good scores from critics, such as Robert Parker. There was praise of Adam for standing up against the seemingly all-too-powerful Mr. Parker, as well as denunciations against him as a hypocrite. While it is wonderfully dramatic and intriguing to imagine a winemaker saying, “I have been serving the critics as lords all these years and making wines I hate to get higher scores”, there is a problem with it, according to Adam it isn’t true. He has been called “Santa Barbara’s original cult winemaker.” Even other winemakers who I’ve spoken with about Adam refer to him with great admiration and respect. Yet, outside of those who personally know him, much of what I had read or heard depicted him in an almost mythical fashion. 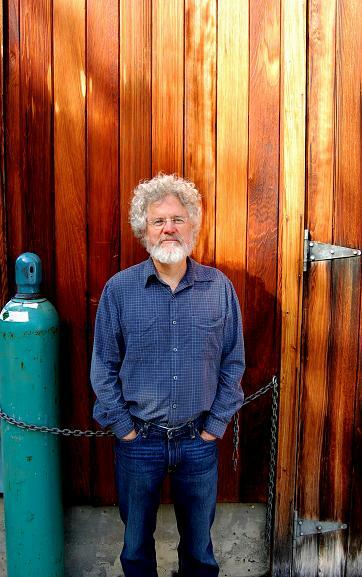 It wasn’t Adam the winemaker from Ojai, the husband, the dad, the guy with really curly hair…It was “The Legendary Adam Tolmach,” the man with the golden touch, the crusader of alcohol reduction! As with many individuals in the wine industry, writers and consumers alike have built him and others up to a William Wallace-like status, more myth than man. Are they real people, or legends that roam the hills never to be truly known, like sasquatch or the chupacabra? When I explained my theory to Adam, that many people seem to have this highly elevated view of him as almost a demigod of wine, he simply laughed and said, “good!” A little mysteriousness is good for business after all. One of the reasons I started this project was to explore the story behind the bottle. However, what has amazed me is how few people actually take the time to talk to the people who produce the wine, rather than write a generic review that could easily be copied from a winery’s website. Everyone wants to analyze and give an opinion about a winery or winemaker. What they think is right, what they thing is wrong. Not nearly enough actually take the time to ask a question or two. A winemaker told me I had to see his land to understand his wines, and this has proved true time and time again. I thought this lack of real conversation was somewhat limited to wine bloggers, but Adam informed me that I would be surprised to know this is similar with many professional wine writers and critics. “It’s surprising how few wine writers visit…I thought that was one of the benefits of the job, you get to go visit all of these interesting places. Either we are too far off the main highway or they don’t get out as much as you think they do.” There was one other explanation he offered. “Maybe people are just afraid of me, and that’s a good thing if that’s the case,” he said with a big smile and a laugh. I write to counteract that problem, the endless cycle of opinion and speculation. It is the end of my fourth month of a twelve-month project and I have already added more than 1,500 miles to my Mazda’s odometer in the pursuit of the story of wine, with little end in sight. Wine can be the gateway to a great conversation, for me it often is. I strive to let the story tell itself and above all to let the words of the people behind the wine shine through. 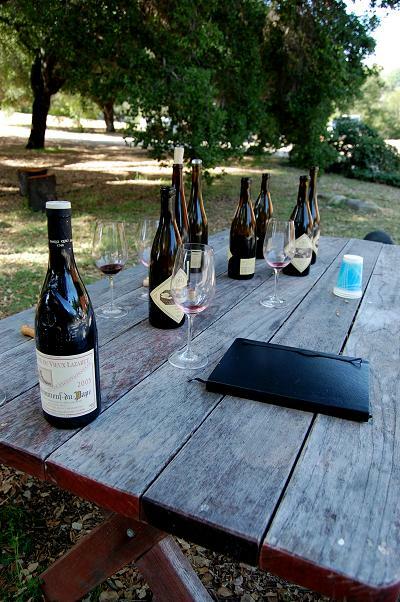 We sat with Adam for several hours at a picnic table under one of his majestic oak trees on a cool Friday afternoon, sampling many of his wines both old and new. So without my analysis of what Adam is doing right or wrong, here is what Adam told me about his thoughts on alcohol content, trends in the wine industry and his own wines. Are American wine consumers too trend focused? Adam’s assistant winemaker Fabien Castel also joined us in the tasting and conversation and he discussed some of his thoughts on trends in American wine. We spoke about a recent Wall Street Journal article about sommeliers increasingly rejecting wines above 14% alcohol. I brought it up in a negative light, that it seemed to me people were jumping on the low alcohol bandwagon all of a sudden. After all, it was not long ago everyone was all for big wines (many still are of course). Fabien offered some interesting insights into the possible reasons for the Sommelier’s championing of wines with less alcohol and more balance. There was a second reason Fabien, who is French and looks at wine from a dual-cultural perspective, offered as a possible reason for the somewhat fickle nature of the American wine consumer and our tendency to follow trends: we are inexperienced in comparison to some of our Old World friends. Much of this, Fabien points out, is a product of the “great interruption” of American wine culture, in the form of prohibition. Prohibition effectively put a halt to American wine culture and continued to shape the culture for decades after its end. We, as Americans, have had a relatively short period of time to build our wine culture and we are still figuring out what we like. At this point I had my one regret in the interview. Adam started to say, “the bad thing about the article about me in The Times…”. That’s all Adam said before we got off subject with the pouring of a new wine and we never returned to his statement. I did not even realize what he had said until hours after I had left. Adam has said he was misquoted in the article, and I had intended to ask him more about that. However, without putting words into Adam’s mouth (especially after I got on my pulpit about that earlier), I think what he was getting at when he started the statement above, is that there is no single taste for everyone. Adam said several times over the course of our visit with him, “it’s not inherently bad,” when discussing various controversial aspects of winemaking. While it would be exciting for me say that Adam declared his righteous indignation against all things high alcohol content and that only a peasant’s palate could enjoy a monstrous red wine, but that was not the case. “It’s a big wine world” as he would put it, so there is room for us all. My curiosity in Mr. Parker has grown over recent months and statements like this add to it. I am too young to have followed him for years and it wasn’t long ago I had never heard of him. However, one can’t get far into wine, without knowing who he is and what he means to the wine industry. I wonder if he really believes that he doesn’t have an impact on the wines some producers make? He has to know, right? I have had winemakers tell me incredibly negative things about him, while others have shared very positive thoughts and stories. I was curious if Adam felt Mr. Parker was unfairly singled out by those who don’t happen to share is taste. After all, the description of him at the outset of this article, that he is “the Sith lord Darth Parker”, is not exactly that uncommon of a view. At best, many feel he has too much power. At worst, some accuse him of being corrupt and tainted by his authority in wine. Has Robert Parker been vilified? I do not want to write a sensational article focusing on merely controversy and sound bites. 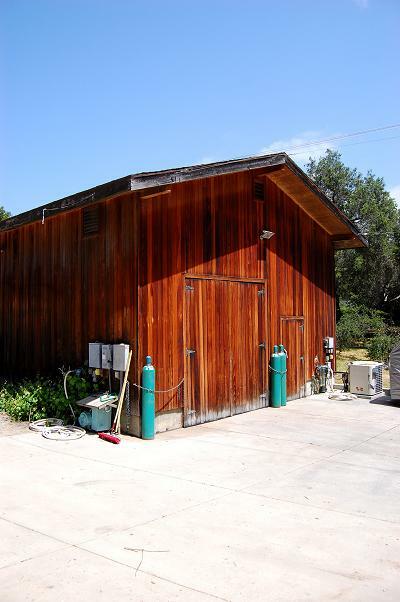 Make no mistake; the real story behind Ojai Vineyard is the inmense dedication and thought that go into their incredibly well crafted and nuanced wines. I can assure you, Adam drinks his own wines and indeed takes much delight in many of them. We tasted through a span covering nearly a decade of vintages, going as far back as 99′. Each wine was a wine of character and individuality. This reflects much of what Adam stands for, that you have to be willing to change with the vintages. Whether it is a discussion of how much is too much new oak, what is the perfect sugar content, or how should the vines be pruned? Each question is met with much thought, discussion, and even experiment to test if the approach is working. So while the higher yields don’t produce a poor quality wine, they don’t produce the wine Adam is striving for, which has more character and a better ability to age well. It costs more to produce fruit this way, but it is right for his wines. Adam carries this kind of deep thought and experimentation into other aspects of his wine making and only does what he feels improves the wine he makes. Some of his vineyard blocks are farmed organically, not because it is in vogue to do so, but because they want “to try to do all the right things” for their wine. What struck me the most about Adam, is his fascination with his craft. He spoke about their recent experiments with various aspects of their production, as if he were still trying to figure out what winemaking is all about. “When you stop learning,” he told me, “it’s time to hammer the nails in the coffin.” In most trades, after thirty years you are on cruise control, but not him. He is still trying to find what works absolutely best for the wines he makes. The results are in the glass. My opinions on wine have been greatly shaped by winemakers over the last few months. Adam was one of the most profound interviews I have done. While some may be convinced that only wines with intense fruit and presence are worth spending serious money on, others will go the opposite direction, seeking subtle and balanced wines that may not be a knockout of the senses. As my taste takes shape, I find great joy in a multitude of styles and feel each has its rightful place, even if I prefer some over the others. The magic of wine is its ability to fit almost any setting, sweet or dry, delicate or powerful. The funny think is after I wrote this paragraph I went to read Adam’s current newsletter and found this statement: “For me, every wine style has its place; I drink light, crisp, minerally Rieslings with lower alcohol levels in the summertime and hearty reds like Châteauneuf du Pape and Amarone in the winter. One of the great joys of wine is that it is so varied-you can always find the right match for the meal and your mood.” Looks like I learned a thing or two from him on my visit. There is no perfect wine, just as there is no perfect human personality. If we all laughed the same way, spoke the same way, and behaved the same way, our world would be much dulled. If all winemakers were chasing the same goals, we would loose the perspective of what wine is supposed to be, an expression of a craftsman working with what nature provided him. Big wines are not inherently bad in as much as delicate wines are not inherently good. They both have a place in our big wine world and for that matter, so does Darth Parker. Fantastic piece of wine writing, man! !